This was immediately picked up by the unionist press, with the P&J being one of the first out of the blocks. They provided a space for the esteemed councillor to air his views unchallenged. 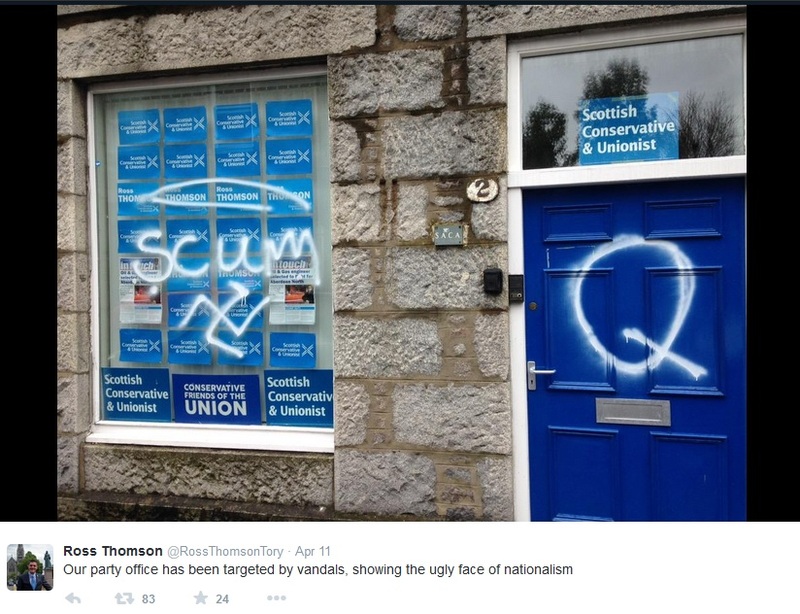 He said, “It shows the ugly side of nationalism and it is really sad to see this happen in Aberdeen.” Now the councillor is entitled to his opinion, but to immediately blame “nationalists” is going too far. Does he have proof? If so the culprits would be caught by now, wouldn’t they? Once they were caught we would expect to see them on the front page of every unionist media outlet in the land (that’s most of them). We would expect the book to be thrown at them very hard, wouldn’t we? But I reckon the culprits will never be caught. Why? Cui bono: who benefits? The councillor certainly benefited from lots of unopposed air time. The Tories and Labour benefited by making the nationalists look bad. The press benefited by selling lots of copy and getting more page views. The whole unionist cause benefited. In fact the only people not to benefit are the nationalists. Fancy that? This entry was posted in Scotland and tagged Aberdeen, Conservative and Unionist Party, Cui bono, Labour Party, quisling, scum, tory on 12th April 2015 by the45.